3 Steps to Thanks – Giving! Be Known for Something : Discover Your Church Communication Thread / Communication Strategy / 3 Steps to Thanks – Giving! We’re to be marked by thankfulness. Colossians 3:15 says to let the peace of Christ rule in our hearts (since we are called to peace) — and then he adds, be thankful! This week in the US, we’re reminded to be thankful. But is that enough? Having a heart of gratitude goes a bit farther. Taking the knowledge of being thankful deeper into your heart. Making a change. But what if we actually were called to action? Like actually “giving” thanks. I think we’d be a different people. Think about the times you want to tell someone “thank you” — but for some reason you felt goofy doing it. I know I sometimes think that someone will think I’m crazy when I stop them to tell them how much I appreciate their kindness or act. But almost every time I do it, people seem to appreciate it. I know that I’d appreciate it if it were reversed. So how can you be thanks – giving? Here are 3 simple ways to get started. Make a list of gratitude. I remember one time in the car on the way to church when I was young, being reminded by my Mother to “count our blessings”. She played the piano at our church and had just practiced a stirring offertory of that great hymn. She told me that when everything seems to be going wrong, stop and consider everything that’s going right! If you try this, you’ll find that the things going “wrong” pale in comparison. Seek out ways to show your thankfulness. This is the trick. Just saying “thank you” has become common place. 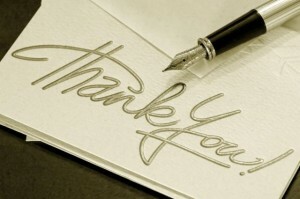 Try to show your thankfulness in a unique way — write a handwritten note, actually call someone just to offer your gratitude, fill out an appreciation form at the restaurant/business, call a boss to say how much an employee means to you, and the list could go on and on. The more time it takes you, the more appreciated it’ll be. Actually carry it out as a priority. A lot of good things die on the altar of good intentions. Actually do it! Don;t put it off, you’ll easily forget. Start small — maybe do it for a week (this is a great week!) and see how it works for you. You’ll discover the principles of the Bible will show themselves to be true. Your life will be different. People around you will notice a change — and seek to do more good things. Remember, these are the rewards and not the destination for your actions. Be thankful just because God tells you to! Colossians ties peace to thankfulness. We experience peace (from God) then we give thanks to God and others. Then we’re rewarded with even more peace! It’s going to be a great week. Let me know how it goes.